I think I might stack all of the food from now on. That way I can say total douche-bucket things like, “Girl you are staaacked!,” when no one is around. Or when everyone is around. Ugh. Stacking is good for you though! It’s healthy stuff. It exercises your balance, your steady hand, your precision, your cursing will power (hi, zero) as the ricotta starts to warm and get soggy seconds before grabbing your camera. We need to stack the food. It helps keep our thriving ecosystem in check. This is so not convincing, is it? You have GAWT to add this to your weeknight rotation. It’s a two-pot ordeal, and the sauce simmers while you pan-sear the stackies. Is it worse that I just called them stackies? Of course you could beef these up with more or different veggies, but not beef. I mean, if you wanted them vegetarian. But you could beef them up with beef if you wanted, I guess. Just don’t call them vegetarian if you do, though. Because beef is a meat. And the sauce, you can tooootally fiddle with. Aaron wanted a vodka cream sauce, but all I had was milk so it wasn’t AS creamy as it could have been. But I’m still a good person. Besides the whole stackies things. I ate both of these and I couldn’t be more giddy. Girl you are staaaaacke – okay fine. Pulse the tomatoes in a food processor until smooth. 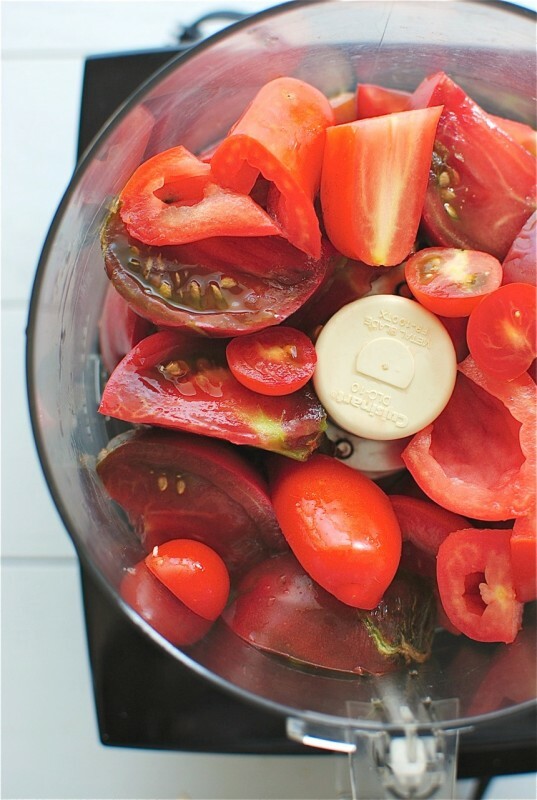 Transfer to a small saucepan and bring to a light simmer. Add the vodka and cream and keep on a low simmer while you prepare the rest. It should thicken over the next 15 minutes. Season with salt and pepper. In a large sauté pan, bring the oil to a medium-high heat. 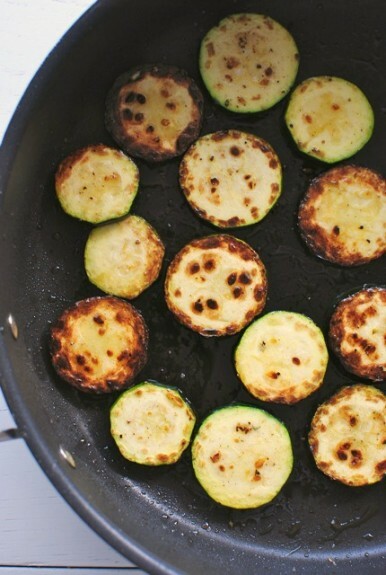 Add the zucchini and let sit on one side for 3 minutes. Season with a little salt, flip and sear another 3 minutes, until browned and tender. Transfer to a plate. Back in the pan, add the polenta slices. Let them sit still for close to 5 minutes. Flip and sear another 5, or until lightly crisped and golden on both sides. Pour a little sauce in the bottom of a bowl. Then layer! Place a polenta round in the center, then a dollop of ricotta, a zucchini slice, and repeat until you have 4 to 6 layers. Top with a little bit of arugula, another drizzle of the tomato sauce, and some parmesan shavings. My parents are on their way up today to celebrate a) my berntday tomorrow (!!) b) a sonogram (!!!) and c) my washed hair (!!!!) So I’ll be back Monday mernin’ with something a little fun. OH JUST YOU WAIT. Toasted Coconut Milkshakes . . . and Babies! Stocked food is so much better than none stacked food. It's just plain fun and I love that! 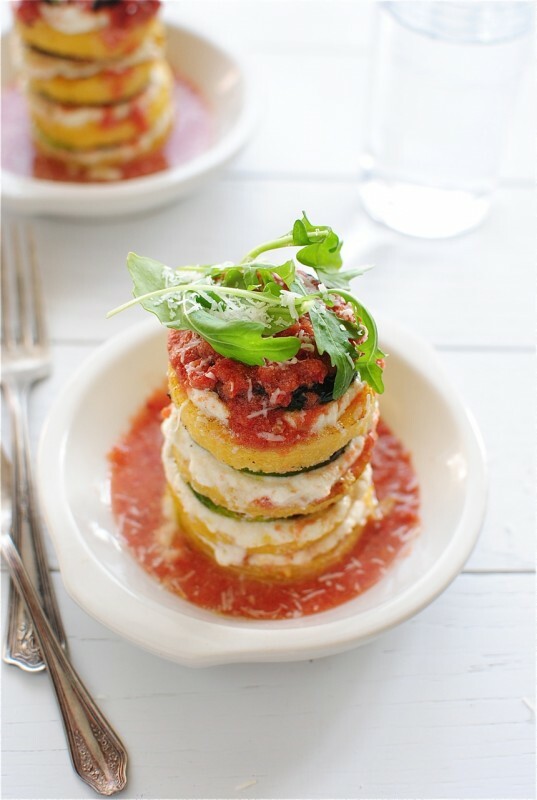 These are gorgeous and I personally LOVE polenta! So I already know these are going to rock my world! No creepy fibrous meat and you even snuck in a little booze! I heart you. This looks incredible. 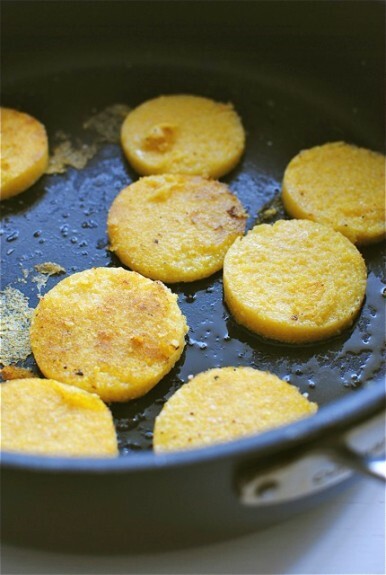 I am a nut for polenta specially when it is grilled or fried! 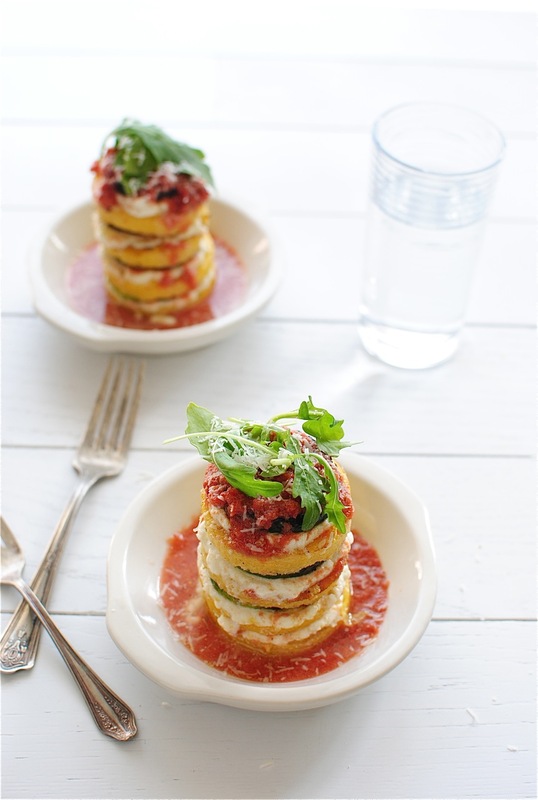 One (okay fine, both) of those Leaning Towers of Lasagna Stack can fall into my face right now! Girl, birthdays, sonograms, epic stacks of fried goodness..you've got it going on today. Yes, please! I'd like one of those towers of goodness! Happy early Birthday! I gotta tell ya, these stacks are calling my name. While I may not have the patience to stack them, I throw everything in a bowl and chow down. these look sooo good! .. I don't think I've ever. had. polenta. is that bad? I think my parents sheltered me too much from food other than beef and pork and potatoes. sad. I need to make these! Have a wonderful weekend <3 and happy birthday in advance. I need a stack or two of these please. I want this for dinner ASAP! LOVE! Such pretty STACKS! :) Love them Bev! You can call these whatever you want- stacks, towers, who cares?- they look freaking delicious and full of all of my favorite things. I just made these for dinner and they were wonderful! I cheated and used a jar of sauce to speed things up but they turned out great! A definite addition to our dinner rotation! I'll take 10 stacks please! 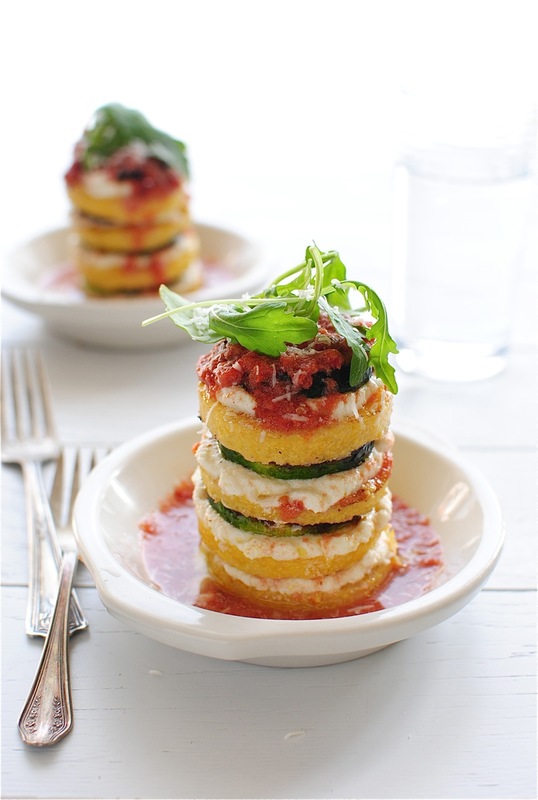 Been looking for a new polenta recipe and this is ideal. Thank you!! These look so amazing! I have a feeling even my kids would love these, especially how tall they are. Well, these just look amazing. Hope you're feeling well these days, Bev! I am in love. With polenta rounds and veggie lasagna. And things that are stacked. Going on a pinning rampage now. Super tasty, super simple, super fast - thanks for the great recipe!